2 the earth was a formless wasteland, and darkness covered the abyss, while a mighty wind swept over the waters. Then God said, “Let there be light,” and there was light. 4 God saw how good the light was. God then separated the light from the darkness. 3 God called the light “day,” and the darkness he called “night.” Thus evening came, and morning followed – the first day. God made the dome, and it separated the water above the dome from the water below it. 8 God called the dome “the sky.” Evening came, and morning followed – the second day. Then God said, “Let the water under the sky be gathered into a single basin, so that the dry land may appear.” And so it happened: the water under the sky was gathered into its basin, and the dry land appeared. 10 God called the dry land “the earth,” and the basin of the water he called “the sea.” God saw how good it was. 12 the earth brought forth every kind of plant that bears seed and every kind of fruit tree on earth that bears fruit with its seed in it. God saw how good it was. Evening came, and morning followed – the third day. 16 God made the two great lights, the greater one to govern the day, and the lesser one to govern the night; and he made the stars. 18 to govern the day and the night, and to separate the light from the darkness. God saw how good it was. Evening came, and morning followed – the fourth day. Evening came, and morning followed – the fifth day. God made all kinds of wild animals, all kinds of cattle, and all kinds of creeping things of the earth. God saw how good it was. God created man in his image; in the divine image he created him; male and female he created them. 30 and to all the animals of the land, all the birds of the air, and all the living creatures that crawl on the ground, I give all the green plants for food.” And so it happened. God looked at everything he had made, and he found it very good. Evening came, and morning followed – the sixth day. 1 [⇒ 1:1-⇒ 2:4a] This section introduces the whole Pentateuch. It shows how God brought an orderly universe out of primordial chaos. 2  The abyss: the primordial ocean according to the ancient Semitic cosmogony. After God’s creative activity, part of this vast body forms the salt-water seas (⇒ Genesis 1:9-10); part of it is the fresh water under the earth (⇒ Psalm 33:7; ⇒ Ezekiel 31:4), which wells forth on the earth as springs and fountains (⇒ Genesis 7:11; ⇒ 8:2; ⇒ Proverb 3:20). Part of it, “the upper water” (⇒ Psalm 148:4; ⇒ Daniel 3:60), is held up by the dome of the sky (⇒ Genesis 1:6-7), from which rain descends on the earth (⇒ Genesis 7:11; ⇒ 2 Kings 7:2, ⇒ 19; ⇒ Psalm 104:13). A mighty wind: literally, “a wind of God,” or “a spirit of God”; cf ⇒ Genesis 8:1. 3  In ancient Israel a day was considered to begin at sunset. According to the highly artificial literary structure of ⇒ Genesis 1:1-⇒ 2:4a, God’s creative activity is divided into six days to teach the sacredness of the sabbath rest on the seventh day in the Israelite religion (⇒ Genesis 2:2-3). 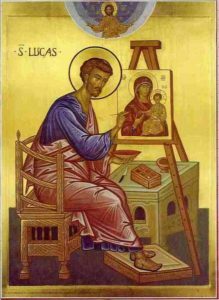 4  Man is here presented as the climax of God’s creative activity; he resembles God primarily because of the dominion God gives him over the rest of creation. 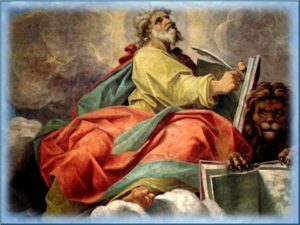 Questo articolo è stato pubblicato in BIBBIA - Antico Testamento - Sacra - Vetus Testamentum, GENESI, THE BIBLE - LA BIBBIA - LA BIBLIA -A BÍBLIA - 圣经 - 聖書 - BIBLIA e taggato con GÉNESIS . Bookmark permalink .